Mozart, Wolfgang Amadeus (1756-1791), Austrian composer, a centrally important composer of the Classical era, and one of the most inspired composers in the Western musical tradition. Born on January 27, 1756, in Salzburg, and baptised Johannes Chrysostomus Wolfgangus Theophilus Mozart, he was educated by his father, Leopold Mozart, who was leader of the court orchestra of the Archbishop of Salzburg and a celebrated violinist, composer, and author. By the age of six Mozart had become an accomplished performer on the keyboard, violin, and organ and was highly skilled in sight-reading and improvisation. Five short piano pieces composed by Mozart when he was six years old are still frequently played. In 1762 Leopold took Wolfgang on the first of many successful concert tours through the courts of Europe. During this period Wolfgang composed sonatas for the harpsichord and violin (1763), a symphony (1764), an oratorio (Die Schuldigkeit des Ersten Gebots, 1766), and the opera buffa (Italian, comic opera) La Finta Semplice (The Simple Pretence, 1768). In 1769 Mozart was appointed Konzertmeister to the Archbishop of Salzburg, and later in the same year, at La Scala, Milan, he was made a chevalier of the Order of the Golden Spur by the pope. He also composed his first Singspiel (a kind of light opera in German with some spoken dialogue), Bastien und Bastienne, in the same year. At the age of 14 he was commissioned to write a serious opera. This work, Mitridate, R� di Ponto (Mithridates, King of Pontus, 1770), produced under his direction at Milan, completely established an already phenomenal reputation. The Mozarts returned to Salzburg in 1771. 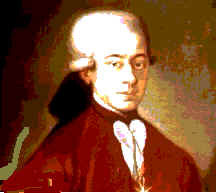 Hieronymus, Count von Colloredo, the successor to the Archbishop of Salzburg, who had died while the Mozarts were touring Italy, cared little for music. Mozart's appointment at Salzburg, however, proved to be largely honorary; it allowed ample time for a prodigious musical output during his next six years, but afforded little financial security. In 1777 Mozart obtained a leave of absence for a concert tour and left with his mother for Munich. The courts of Europe ignored the 21-year-old composer in his search for a more congenial and rewarding appointment. He travelled to Mannheim, then the musical centre of Europe because of its famous orchestra, in hopes of a post, and there fell in love with Aloysia Weber. Leopold promptly ordered his son and wife to Paris. His mother's death in Paris in July 1778, his rejection by Weber, and the neglect he suffered from the aristocrats whom he courted made the two years from Mozart's arrival in Paris until his return to Salzburg in 1779 one of the most difficult periods in his life. While at home Mozart composed two masses and a number of sonatas, symphonies, serenades, divertimentos, and concertos; these works reveal for the first time a distinctive style and a completely mature understanding of musical media. The success of Mozart's Italian opera seria Idomeneo, R� di Creta (Idomeneo, King of Crete), composed in 1781, prompted the Archbishop of Salzburg to invite Mozart to his palace at Vienna. A series of court intrigues and his exploitation at the hands of the court soon forced Mozart to leave. In a house in Vienna rented for him by friends, he hoped to sustain himself by teaching. During this period Mozart composed a Singspiel called The Abduction from the Seraglio, which was performed for Emperor Joseph II in 1782. In the same year Mozart married Constanze Weber, Aloysia's younger sister. Unending poverty and illness harassed the family until Mozart's death. The Marriage of Figaro (1786) and Don Giovanni (1787), with librettos by Lorenzo Da Ponte, while successful in Prague, were partial failures in Vienna. From 1787 until the production of Cos? Fan Tutte (All Women Do So, 1790, again with a libretto by Da Ponte), Mozart received no commissions for operas. For the coronation of Emperor Leopold II in 1791 he wrote the opera seria La Clemenza di Tito (The Clemency of Titus; libretto by Metastasio). His three great symphonies of 1788no. 39 in E-flat, no. 40 in G minor, and no. 41 in C (the Jupiter)were never performed under his direction. While Mozart was working on the Singspiel The Magic Flute (1791, with a libretto by Emmanuel Schikaneder), an emissary of a Count Walsegg mysteriously requested a requiem mass. This work, uncompleted at Mozart's death, proved to be his last musical effort. It was completed after his death by Franz S�ssmayr, one of his pupils. He died in Vienna on December 5, 1791recent research suggests the cause was chronic kidney failure. His burial was attended by few friends. The place of his grave is unmarked. The legend that the Italian composer Antonio Salieri murdered him is unsupported by reputable scholars. Mozart had an unsuccessful career and died young, but he ranks as one of the great geniuses of Western civilisation. His large output (more than 600 works) shows that even as a child he possessed a thorough command of the technical resources of musical composition as well as an original imagination. His instrumental works include symphonies, divertimentos, sonatas, chamber music for a number of instrumental combinations, and concertos; his vocal works consist mainly of church music and operas. Mozart's creative method was extraordinary, for his manuscripts show that, although he made an occasional preliminary sketch of a difficult passage, he almost invariably thought out a complete work before committing it to paper. His music combines an Italian taste for clear and graceful melody with a German taste for formal and contrapuntal ingenuity. Mozart thus epitomises the Classical style of the 18th century, the goal of which was to be succinct, clear, and well balanced while at the same time developing ideas to a point of emotionally satisfying fullness. These qualities are perhaps best expressed in his concertos, with their dramatic contrasts between a solo instrument and the orchestra, and in his operas, with their profound contrasts between different personalities reacting to changing situations. His operas achieved a new unity of vocal and instrumental writing; they are marked by subtle characterisation and an unusual use of Classical symphonic style in large-scale ensembles.